Lane closures as city centre roadworks continue, but with no completion date are they neverending? Work is progressing on Peterborough City Council’s revamp of Lower Bridge Street with one lane over Town Bridge shut during the day. 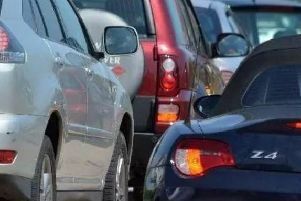 Roadworks began last Monday, January 9, but readers have been contacting the Peterborough Telegraph to find out exactly how long the works will last, as the signs do not state the details. Councillor Peter Hiller, cabinet member for growth, planning, housing and economic development, said: “The Lower Bridge Street works are progressing well and I think anyone who has walked through the area recently will have noticed a difference with the new paving and improved entrance to the Rivergate Shopping Centre. “The purpose of these works is to bring the standard of the area up to that of Bridge Street and Long Causeway, improving the environment for visitors to the south side of the city centre. We have had really positive feedback on the other public realm improvement works, which have helped attract new shops and restaurants as well as boosting trade for existing businesses. “We will continue to strive to keep disruption to a minimum, particularly for the businesses on Lower Bridge Street, although we do appreciate that the lane closures being put in place while work is carried out to improve the traffic signals and crossing may cause some delays for motorists.